Play with your interior! The pentagonal, matt-black coloured Basket side table by Cascando brightens up your room. The stands of the side table consist of steel wires connected to a pentagonal base. The tables have a matt powder coating. This gives the tables a pleasant appearance and durable character. 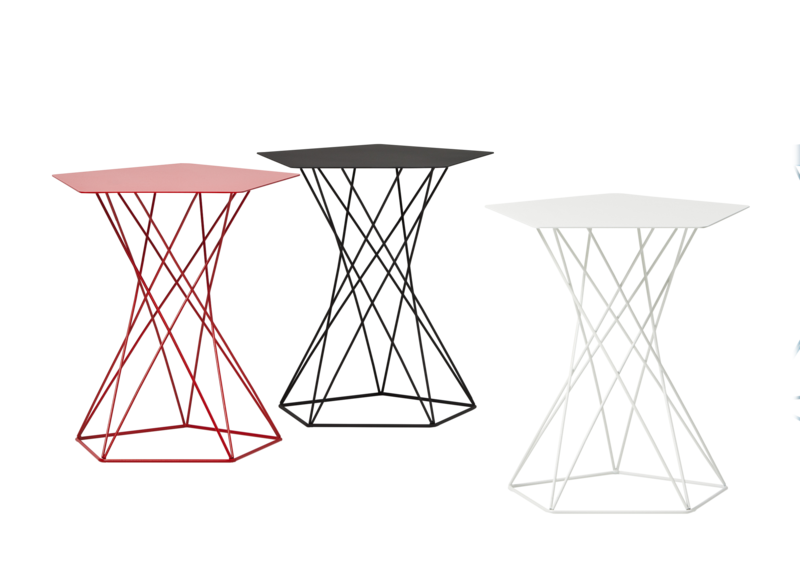 Tip: create a larger table by placing multiple Basket side tables of different colours (red, black, or white) next to each other. The Basket side table by Cascando has a striking appearance. The table has a pentagonal shape and consists of steel wires ingeniously connected to a base with pentagonal contour. These wires give the Basket side table an architectural appearance. This pentagonal designer furniture is therefore suitable for any modern interior. The Basket tables by Cascando are designed as side tables. Their height is therefore only 50 cm, the width is about 42 cm. The Basket is available in 3 stylish matt colours; black, white, and red (RAL 3020). Designer Peter van de Water is inspired by the simplicity of form, function, and construction. As a result, the table top and base of the Basket designer side table black by Cascando have a pentagonal shape. The table top is connected to a base with steel contour by means of ingeniously connected steel wires. The shape of the table top ensures lots of flexibility when placing the table in your interior. By placing multiple (coloured) tables next to each other you can create a playful, yet stylish, symbiosis. Cascando has an excellent team of designers. The designs are innovative and have their own unique personality. Cascando is known for its use of high-quality materials, finishing, and durability. They devise, develop, and produce all their interior products - including the black Basket side tables by Cascando - themselves. They make every living and working space more personal and inspiring!